Hello everyone! One of my most frequently asked about topics is craft storage and I’ll be the first to admit that I haven’t figured out perfect ways yet, but these items I’m sharing today have really helped with some areas that I have struggled the most. When Scrapbook.com reached out and asked if I’d be interested in reviewing some storage products I immediately said yes when I saw that one of the items was something that I ‘d been using already. Check out the video to see details on what I’m using and how I’m using them! The first item is this Caddy Organizer System that you can customize for your storage needs. The set I have comes with the white caddy and a small, medium, and large container that fits inside. 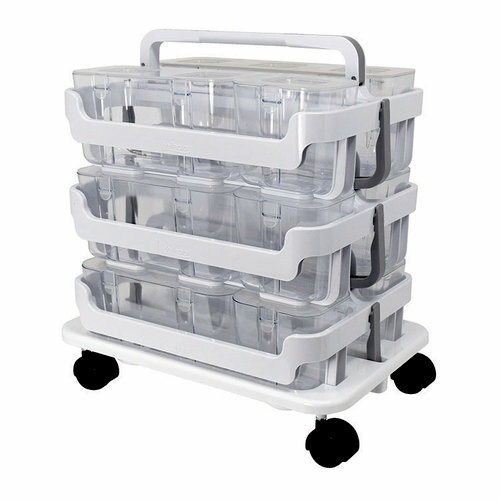 The caddy includes a locking mechanism that allows you to stack up multiple sets of these and you can also purchase a base that has wheels to attach to the bottom. This would be a great way to create a customized craft cart that you can wheel into a closet if you don’t have a designated craft space and need to hide away your supplies when not in use. The options for what to store in these clear containers are endless! I’ve been on the hunt for a cost effective way to store my Distress Oxide Inks and this is perfect for that! 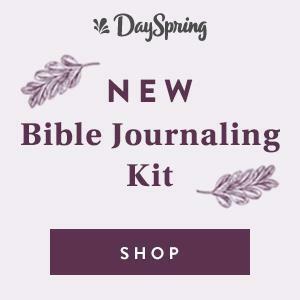 I plan on having some of these for storing my supplies that I use in the Bible Journaling workshops so I can keep everything organized, easy to see, and easy to grab ‘n go! The lids do snap shut so you don’t have to be afraid that your supplies are going to fall out and create a mess when you are traveling with these containers (a definite win in my book)! But don’t stop at craft supplies! You could use these in a toy room or kitchen…I even though about using some to organize some of my camping supplies! 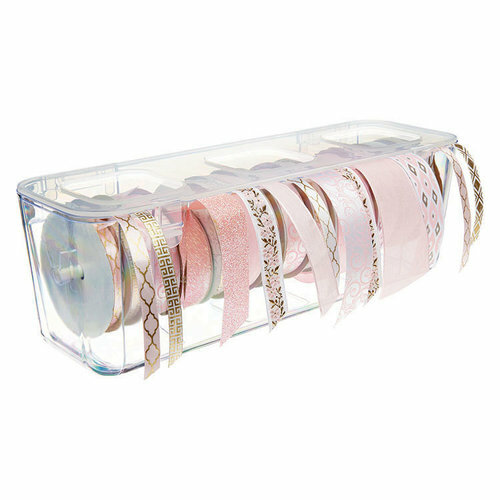 You can also purchase some specialized compartments that fit inside the caddy, like this Ribbon Dispenser. My ribbons were all thrown into a box and were a giant mess but now they are organized and easy to reach for! 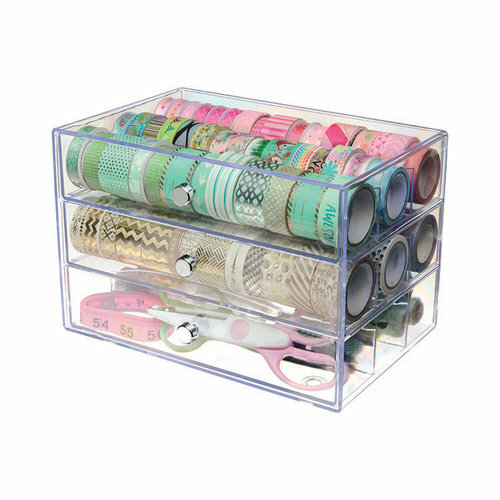 Deflecto also has this Washi Tape Storage Cube which is probably my favorite storage solution! 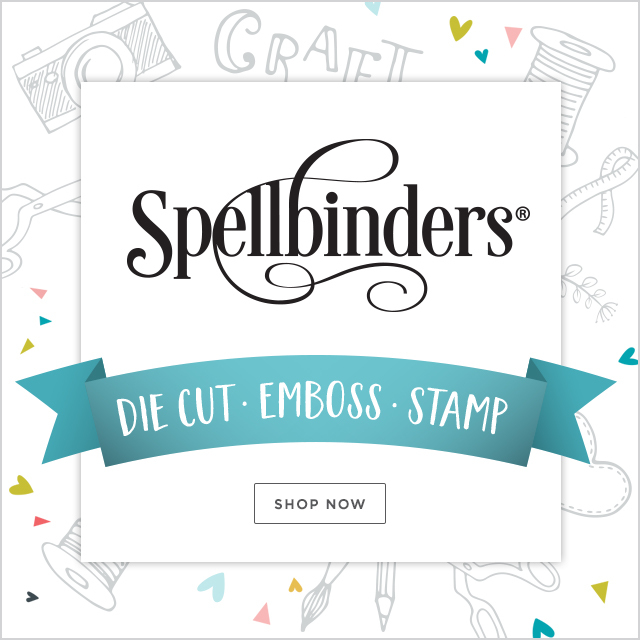 I’ve actually been using this system for a while and it’s what made me agree to try out some of the other products that Scrapbook.com was offering to send to me for review. This acrylic drawer system can hold around 150 rolls of washi (depending on the width) and I love that I can see everything inside so I don’t forget to use them! 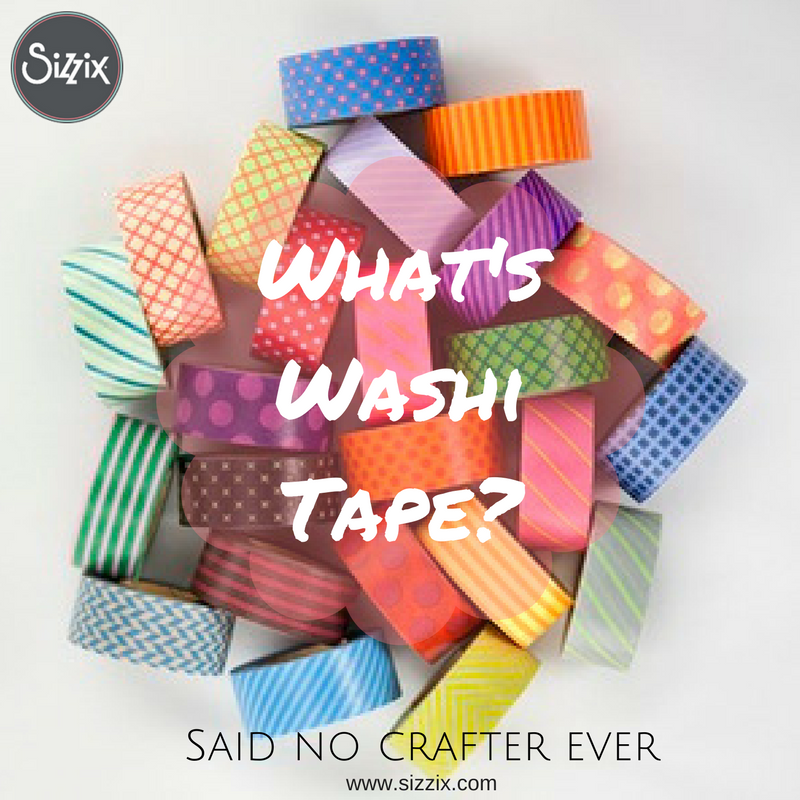 If washi isn’t your thing, you could also store brushes, markers, Gelatos, beads, etc….let me know in the comments what you would store in this! I hope that these products give you some ideas for how to organize your craft space. I’ve found that I have an easier time creating when I can see all of my products and reach for them easily! Check out the video for more details on how I’m using these in my space and check out the links below to grab some of these for your storage needs!